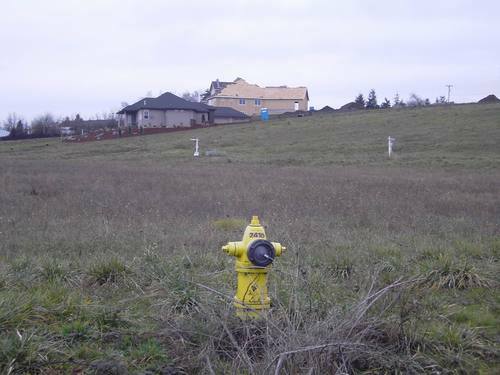 Now that the Oregon Supreme Court overturned a lower court ruling that found the Measure 37 property development law unconstitutional, Oregonians need to figure out a way to pay for the high cost of development outside of urban growth boundaries around the state. Traditionally when developments are built, taxpayers are responsible for most of the short and long term costs. These costs include but are not limited to: new roads, sewer and water systems, emergency services and schools. Developers kick in a small percentage of the short term costs, a.k.a "impact fees", when the development is approved for building. As Happy Valley residents are quickly learning (pdf), those "impact fees" are not enough to cover the costs of running a community, even within an incorporated area where efficiencies are already available through existing infrastructure. So how will we pay for M37 development? This is what I propose: Property owners and developers who want to build subdivisions and the like outside of urban growth boundaries, and therefore away from established infrastructure, should pay for 100% of the cost of roads to and from the developments, the upgrading of existing roads near the developments, sewers and/or septic tank impacts, public water lines that may be required due to the likelihood of low water tables in rural areas, impact to the local school district (a formula could be established that would calculate the cost each new house would have on nearby schools), a percentage of the future costs to upgrade the rural freeway interchanges that feed into these new developments (the cost could be calculated based on the number of homes in new developments that are dependent on particular freeway entrances and exits) and any other required services such as electrical lines. Oregon taxpayers should not be responsible for paying a single penny of any development costs outside their cities' urban growth boundaries. If property rights activists believe that property owners can do whatever they want with their property or be compensated by the government for not being able to develop, then those owners should pay for the cost of their development in full, thank you very much. After witnessing miles of public water lines being put in, roads upgraded, trailer buildings being added to the local overflowing school, a freeway interchange upgrade that cost close to 75 million, etc. all in the name of several big rural subdivisions near my mom's farm in Clark County, Washington, I was appalled to learn that the state and county taxpayers were paying for most of it. The feds kicked in a few mil for the interchange upgrade since it was on I-5. The landowners and developers walked away with hundreds of millions. The minimal impact fees that they had to pay were simply passed on to the new home buyers. So, are the anti-tax activists with me on this? Oh, I forgot, they're some of M37's biggest supporters. They want their bread and they want it buttered too. This year I wasn't going to watch the Winter Olympics, except for the men's and women's downhill and the ongoing rivalry between the Norwegian and Italian cross country relay teams (and the Norskies let me down this time), but I am now officially caught up in the Chad/Shani speed skating soap opera. It's the Chicago White Socks vs. the Houston Astros all over again, but with drama. As blue-collar workers in Illinois cheer Shani on, energy execs from Texas are rootin' for Chad, or so the made for "sports fans with an interest in politics" story goes. And to make things even more beefy, Chad insinuated that Shani was unpatriotic for not participating in the team pursuit speed skating event, where Shani could have helped Chad win another medal, but Shani wanted to save his legs for his strongest event, the 1,000 meters. And he won the gold, while Chad sat up in the bleachers pouting with his own gold medal from another event. A little girl who was skiing on the bunny slope was chenied hard by a drunken snow boarder who ignored the bright orange "SKI SLOW" signs on the slope. The buzz is on (Loaded Orygun has the scoop): Rep. Greg Walden (OR 2) may have to start looking behind his shoulder at a possible challenger, Steve Silver. A discussion is going on over at Daily Kos on whether or not Silver even has a chance against an R-incumbent in strong R territory. This shouldn't be the point of putting up a challenger to Walden. The point is, Dems should challenge the GOP in every nook and cranny district in this country. They should challenge them in order to begin chipping away at the false foundations of the modern Republican party. Silver has a load of issues he can work with in eastern Oregon to begin the chipping: 1) There is a high percentage of eastern Oregonians who are on Medicare, and as I pointed out in the comment section on Kos, there's no doubt those folks find the new Medicare precription drug program totally frustrating, 2) Our public lands are at stake and many eastern Oregon families enjoy hunting excursions on those lands, but are finding it increasingly difficult to do so, 3) Those same eastern Oregonians who are on Medicare also depend on their monthly Social Security checks and they don't want anyone messing with them, 4) Many of the twenty-somethings from eastern Oregon are in the military and are in Iraq or have served in Iraq. Some of them have come home in body bags, others have come home severely injured. There's no end in sight, no plan, no nothin', 5) GOP corruption, 6) and finally Silver can ride the Oregon Apollo wave! We shouldn't look at this as a possible pick up. Instead it should be about the long term vision and hard work it will take to help eastern Oregonians understand that progressive Democrats in Oregon truly care about the general welfare of the people in this state. In the meantime if Silver runs, let's do everything we can to help him. And who knows, maybe those in Oregon's second district just might be willing to make a change this year. Has everybody in the GOP noise machine gotten the new memo? It looks like it. The Oregon GOP certainly is on board, although Kevin Mannix must have had his memo under a pile of papers since he was the last one of the GOP gube candidates to join in on the chorus. And what is this all so important memo about? Illegal immigrants and how they're robbing our state treasury. Forget gays, they're so passe, so 2004. It's illegals now. Yup, they're taking over. They're picking our onions, milking our cows, building our houses, cleaning our tables at our favorite restaurants... Wait a minute! Did the Oregon GOP get their memo cleared with the Oregon Restaurant Association, Oregon Home Builders Association and large farms like the Threemile Canyon Farms dairy? Are they biting the hands that feed them? Or is the whole illegal immigrant talk just another ploy to get righties all worked up so that they'll be motivated to send their ballots in rather than putting them through the shredder in an election year where Republicans aren't nearly as popular as they were in '02? But then again do the business members of the above mentioned associations care if the illegals whom they've hired get cut off from any public services? Do they care if Pablo's little girl doesn't have access to English as a Second Language classes in her school? Probably not. Who cares if Angelina doesn't learn English... goddammit, those people won't even learn to speak our language! So, it's a win-win for Republican candidates and the above mentioned associations: The GOP gets their base out on an "Us vs. Them" issue and home builders get their tax cuts while keeping their illegals who've just been pushed down one more rung on the ladder, and of course this pulls down the rest of Oregon's legal manual workforce with them. It's a real win-win for those at the top. A...sparring session came when Senator Ron Wyden, Democrat of Oregon, pressed the intelligence officials about whether a controversial Pentagon data-mining program called Total Information Awareness had been effectively transferred to the intelligence agencies after being shut down by Congress. Mr. Negroponte and the F.B.I. director, Robert S. Mueller III, both said they did not know. Then came the turn of Gen. Michael V. Hayden, who headed N.S.A. for six years before becoming the principal deputy director of national intelligence last spring. "Senator," General Hayden said, "I'd like to answer in closed session." Not much of a guessing game on this one! Every single member of Congress who helped put a stop to TIA should be red-faced stompin' mad that the Bush administration has completely ignored them. Not only did the admin pick up TIA in Bush's Spy Program, but they expanded on it. Let our Senator Wyden know that you support his tough line of questioning on this constitutional matter. John Kerry is too tall to be French. And besides, the French thing is so passe, David. Get a life.